A step-by-step blueprint to profit from your skills. 2015 was the first year that my business – owned 50/50 with my business partner ‘Diggy’ – generated more than $1 million in revenue. It felt weird to look at our bank account that year, and it still feels weird writing about it today. To understand how we got to that stage from our many failed online ventures, we need to go back around a decade to 2006. I was 16 years old and had just started my first ever marketing ‘agency’. I fell in love with SEO after successfully ranking my website for DJ’s for terms like ‘DJ forums’ and ‘DJ equipment’ so decided the next logical step was to offer it as a service to other businesses. I registered the domain name ViperChill.com (the name mostly inspired by my love for the Dodge Viper) and used a website template from a friend which required me to manually upload pages every time I wanted to write something new (blogging was not a thing back then). The site had to run on a Windows server as it was mostly written in ASP.net; a language I didn’t understand. Here’s how it looked back in 2006. For 18 months I interacted in SEO forums and wrote articles sharing my theories on how Google rank websites. This website, which I thought was going to help me quit my part-time job so I could work online full-time, brought in exactly zero clients. As it turns out, getting people to pay you for your services is exponentially harder when no-one is visiting your website. 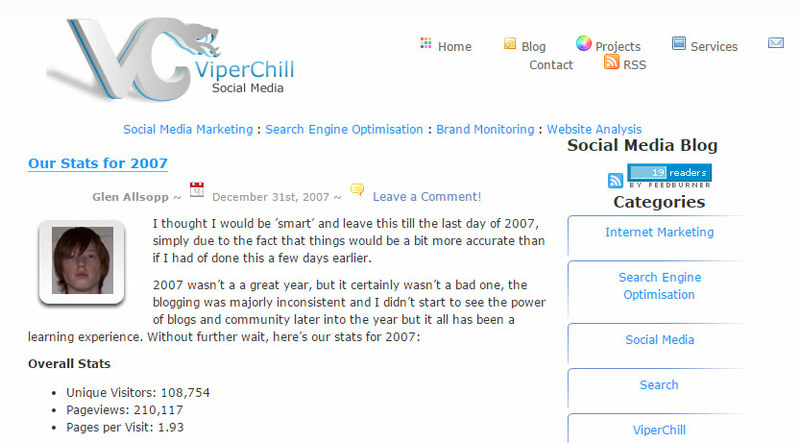 Of course I knew about generating traffic from Google, but I was trying to rank ViperChill for ‘Search Engine Optimisation’ (with an ‘s’ because I’m British) which is literally one of the most competitive terms on the planet, so I still had many months or years to go until that happened. Later, when blogging did become a thing, I started producing a lot more content. I’m talking about hundreds of articles. The site also underwent a bit of a makeover. The site did look a little better than this – Archive.org couldn’t load the original stylesheet properly – but the feed count is accurate. My updates had a massive following of 19 people. That being said, things started to look up. 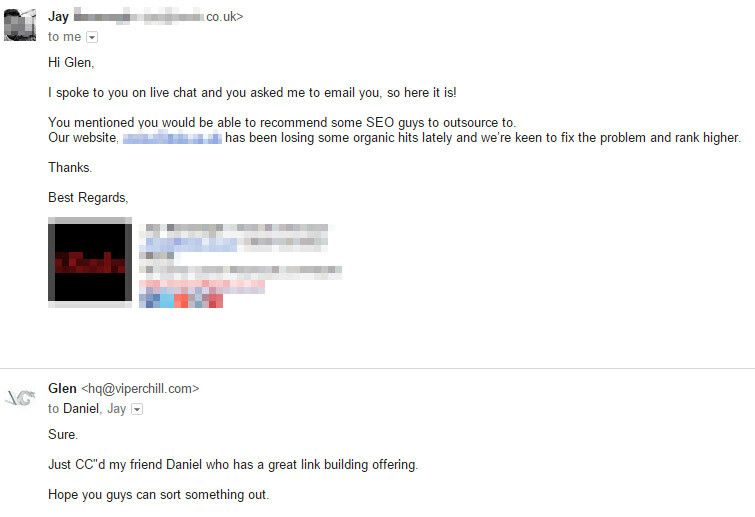 Some companies did actually get in touch with me to do SEO for them. They really weren’t the kind of clients I was looking for though. For some companies I would be writing blog posts and for others I would be trying to optimise websites built in languages I didn’t understand. I would make $500 or $1,500 here and there, but landing new clients was inconsistent, and I wasn’t enjoying doing the work like I had for my own sites. To cut a depressing story short, I decided to give up on my dream of running a successful agency, I accepted a job to work for another agency (which meant moving from Newcastle, England to Cape Town, South Africa) and spent the next 18 months working for somebody else. I don’t want to bore you with too much of my personal story, but let’s jump to 2010 for a second. 2010 was the year I was able to quit my job at the marketing agency after having a lot of success ranking affiliate websites in Google. I still loved SEO, I just hadn’t found clients that I wanted to work with who would pay me for my services. I would continue to build affiliate sites, blogs, proxy websites and every other type of website in my venture to make money from the internet. Later, in 2013, I discovered NPE. I know it sounds cliché, but I read about the success of this one business and it literally changed my life. I think that’s why I’m so passionate about writing here for Gaps — I know what reading one successful case study can do for your drive and motivation. Started by Sean Greeley, NPE was a marketing agency pulling in millions of dollars per year, with a twist. I wasn’t only intrigued by their success because of their revenue numbers, but because of their marketing angle. They actively turned down 99.9% of people who wanted to work with them. They were offering many of the same services as me, such as SEO and email marketing, but only worked with gym owners and personal trainers. Although their results were undeniable, I still couldn’t understand how they were achieving them. How was this one company that were focusing on such a small sector of the market making more money than I could ever dream of, and I had been trying to offer services to the entire planet? The answer, ultimately, was relevance. I would later discover that around 75% of companies are pitched marketing services at least once per week. Meaning they’ve heard every kind of proposal, offer and “guarantee” to improve their website traffic. That’s a monumental shift in thinking, and had a monumental impact on their conversions. To be clear, I actively searched for other agencies who were doing something similar. I wanted to make sure that this wasn’t just some ‘fluke’ and the idea of a marketing agency just for a specific niche wasn’t only limited to NPE. Following are some of the best examples I’ve found over the years, with the industry they’re offering marketing services for in (brackets). Not every marketing agency is going to make millions of dollars right off the bat of course. Publicize, founded by a writer for tech-blog VentureBeat, generated $100,000 in the first year of running their agency. Focused on helping startups on a budget – the exact type of people who try to get press on blogs like VentureBeat – I would say it was a very wise decision. Showroom Logic offer software and programs to help automotive dealers with their internet marketing. Currently sitting at number 505 on the Inc 5,000, they’re one of the most profitable private companies in Miami. I’ve been following Showroom Logic since 2013 when they were making a few million dollars per year, so it’s great to see their continued success. 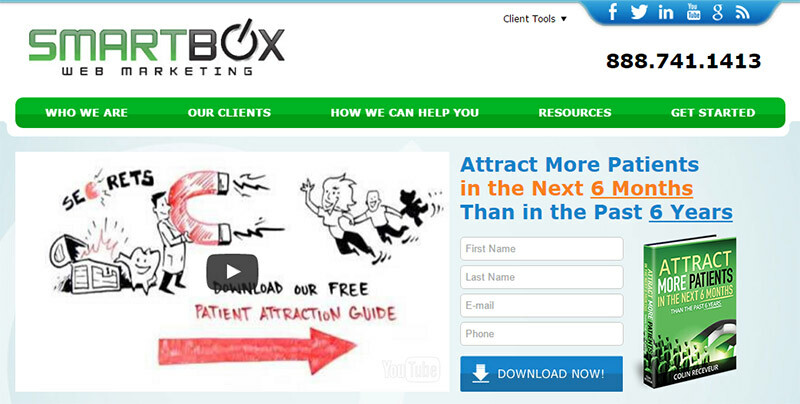 According to Owler, Smartbox Web Marketing are doing annual revenues close to ten million dollars. Their target market, are dentists. Dentists make more money the more people they get through the door, so it makes sense that they would be willing to pay for websites, email marketing, paid ad campaigns and search engine optimisation help in order to make that happen. 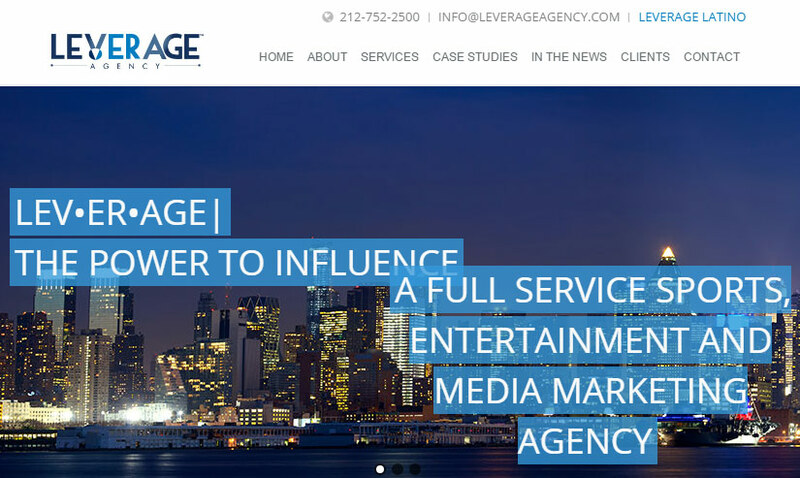 Now one of the most recognised companies in sports consulting, Leverage Agency was started in the New York City apartment of founder Ben Sturner back in 2006. Just a few years later they were generating millions of dollars and had offices in New York, Washington, LA and even Beijing. While they offer far more than just internet marketing services – such as event organisation and event sponsorship’s – they have a large focus on “social media and digital” as part of their offerings. AdultSEO.com (no links as the site is slightly NSFW) really shows that there are opportunities to become an authority in any industry. Boasting over 500 clients, the business is actually now for sale, but it shows how niche you really can be to attract targeted clients. Just after my discovery of NPE I came across Salon Success Strategies, who – as you can probably guess by the name – offer online marketing services to salons, day spas and medical spas. The reason I love this example is because the founder and CEO, Heather Lemere, actually owned a salon for a number of years and learned lessons from marketing her own business they she could teach to other salon owners. The last known record I can find is from 2014 when the business was on track to pull in $800,000 for the year and had grew to 51 customers and 8 full-time employees. Later branding to S3 Marketing Agency, it looks like Heather’s business has went from strength to strength. Another one that I have been following for a number of years, Muscle Up Marketing have really taken hold of the health and fitness market. Like NPE, their primary target clients are gym owners and personal trainers, most commonly based in the United States. Their entire angle is focused on helping businesses get more leads, and they do so by offering services like email marketing, text message marketing and direct mail postcards. I hesitate to say it was an overnight success, but it many respects, it was. As soon as we started offering just a certain service (typically reputation management or link building) for specific areas and industries, we found businesses reaching out to us on a regular basis. In all honesty, I think our revenue numbers would be a lot higher if we agreed to “set up shop” in one location and actually meet clients in person. When you start having some success online and realise you can work from pretty much any place in the world you want, it’s very rare to find people who do want to stick in one place. At least those without a spouse and kids. Unlike all of the businesses mentioned above, we do not have a dedicated office and we do not meet any clients in person. Out of more than 300 clients we’ve worked with there have only been two exceptions to this rule. One exception was first a close friend who asked me to help him market his website, and the second was literally in December of 2016 where my business partner Diggy made a trip to Singapore (we have a brand focused on helping Singapore businesses) to close a great reputation management deal. I was hesitant to include this image for people who are just skimming the article and looking at pictures, but I want to be totally honest upfront. This deal was literally just closed so I’m sharing it here. If we were willing to settle down in one location – or at least have offices in the places we target – I’m confident myself and Diggy could have a lot more success with these agencies and close a lot more clients. But that isn’t what we want to do and I doubt we ever will. 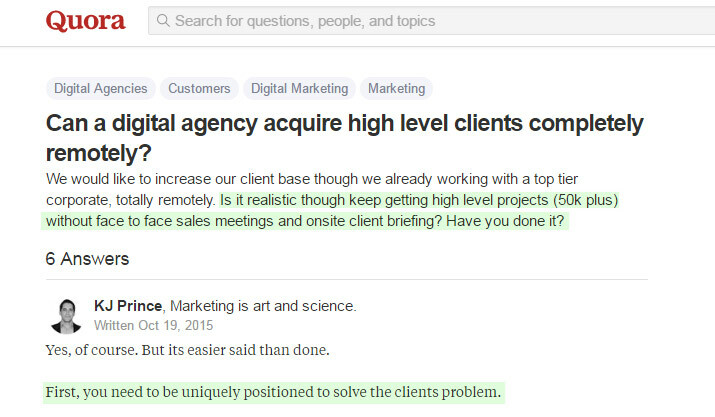 Our ideal client is someone who hires us to do work for them and then they completely ignore us (while continuing to pay) as long as we are getting results for them. Fortunately, this is the scenario we were able to create. 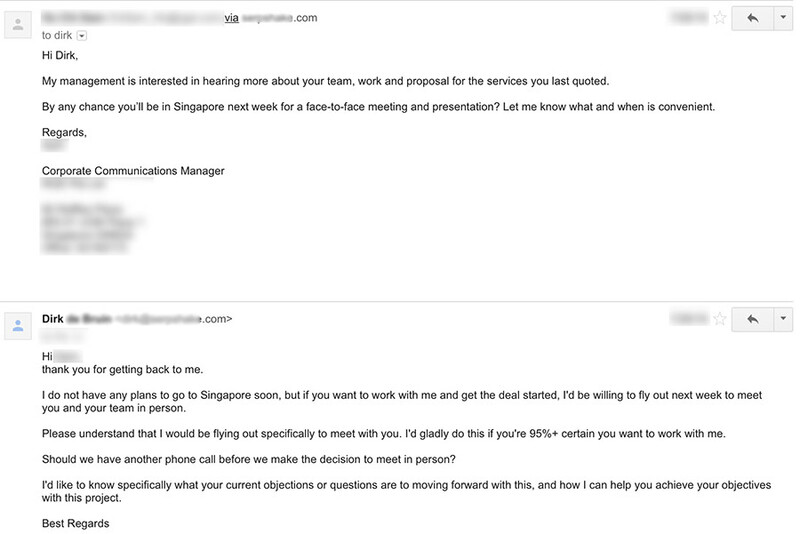 The “secret” to our success is this: You must market yourself as specialising in a specific service for a specific location (like Singapore) or industry (like Automotive) to get people to pay you handsomely without having to meet them in person. Companies understand that if they want the rare person who only does ‘X service for X industry’ that person is not always going to be on their doorstep. I’m not the only one with these findings. You’ll see a lot of similar viewpoints on Quora. Due to the way we market ourselves – typically ranking for “[industry] link building” or “[location] SEO” – we receive 2-3 enquiries per week from large companies looking for our services. We weren’t sure if this ever was the real Alibaba (they’re worth billions of dollars) but it was cool to receive. Of course, not all enquiries turn into closed deals. Some think our prices are too high. Some want to meet in person. Some want us to check in with them on a weekly or daily basis. This one, from another company worth billions of dollars, was definitely real. Our rules about who we work with may seem a bit strict, but we don’t want to make money and be miserable. We typically only find a good fit with a very small number of companies that get in touch, but it works for us. Whenever I tell other people about this business model there’s an understandable doubt that always comes up. Let’s look at things from another angle. What do you want to learn for yourself? I learned SEO to get more traffic to my website for DJ’s. I realised I loved it, and the rest is history. Do your copywriting skills need work? Do you want to figure out paid ads? Are you curious about how words can affect conversions? It’s in learning something that will help your own business where you see opportunities to apply what you learn for others. 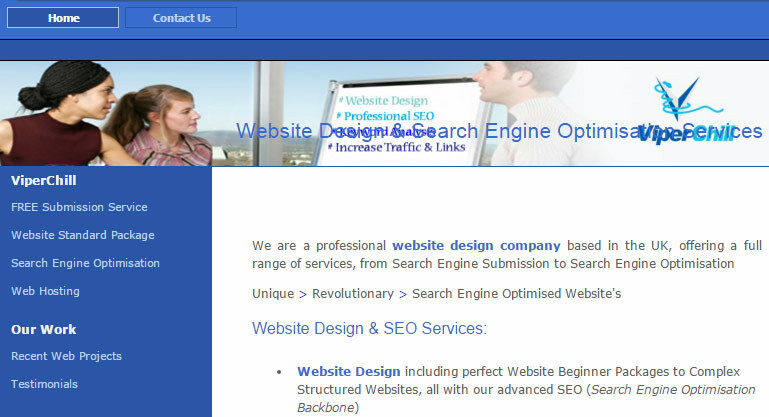 You’re not expected to become the best in the world at SEO or website design or writing copy. There’s only one space for that. However, you can become the best in the world, or at least very close to it, offering SEO for Dentists, or Web design for SaaS startups, and so on. We found that, ironically, limiting your potential audience is far more profitable. The worst case scenario is that even if you learn some new marketing tactic and can’t get others to pay you to do it for them, at least you now know how to do it for your own web projects. I have over an hour of free training on this topic if you would like to learn more, but here are some of the success stories from the people we’ve taught about this business model. Though I’ve been teaching this business model for a number of years, people are still starting right now and getting results. You can see the second last screenshot above is from December, and the last one is actually from the past week. Throughout the years of sharing profitable website ideas, from a website called Cloud niche, to a service called Inc ideas and now Gaps, this is part of a business model I’ve consistently helped others succeed with, and had consistent success with myself. If you’re making the majority of your income via a particular traffic or revenue source, there’s always a risk that your business could (literally) disappear overnight. Google make hundreds of changes a year to their algorithm. Facebook ban advertising accounts with no warning (I lost a $60,000 account without so much as a goodbye email). Amazon changed their rules about allowing product reviews in return for the product. With this business model you’re not reliant on one client or one traffic source. If you lose a client, you still have (and can get) many more. If one traffic source isn’t working out there are hundreds of others you can rely on. Many of the tasks involved in creating and marketing websites follow a fairly step-by-step process. If you want to rank higher in Google you need to do keyword research, create valuable content around those terms and then focus on growing an audience of people who can link back to you. If you want to design a website you need to understand HTML & CSS (and probably Photoshop) to either build something from scratch or edit an existing template. While there are some sparks of genius in online marketing at times – such as creating a video that goes viral or writing content that naturally picks up hundreds of links – the services I offer typically follow a step-by-step formula to get the client what they want. And because it’s step by step, it means you can train other people how to do the work, and build up a team who operates very efficiently without you. When I started out online there were are only 10 blue links on Google results page. Today, search results are full of answer boxes, related query suggestions, ads and maps. Every business in the world wants to be on the first page of Google for their desired keywords, but there are only a limited number of spaces, meaning 99.999% of businesses are willing to fight (read: pay) to get to the first page. There will never be a shortage of client opportunities because there is not a single business in the world that doesn’t want more customers. Do you know where I am right now? Do you care? My clients don’t. Some businesses are looking to work with a marketing team they can call into their office each week and chat with in person, sure. But when you’re a specialist for a particular niche or with a particular marketing angle, agencies accept that they can’t always get that on their doorstep. This opportunity doesn’t just apply to people in the US or UK either. Every business on the planet wants more leads, and they’re increasingly turning to the internet with their marketing budgets. In 2015, 8 out of 10 of the agencies saw an average increase in turnover of 36% which means that they’re all feeling rather positive about 2016 with 80% confident in the future. Too right. The ever evolving and fast moving world represents great opportunities for agencies who are smart, agile and brave. This is not a dying industry. This wouldn’t be a proper Gaps update if I didn’t share different angles and opportunities you can take to also see results. I’m immersed in this industry on a daily basis so these Gaps were easy to think of but more importantly, I already know as a fact (not just theory) that someone could make a ton of money in these industries. There’s a common theme behind all of the different services you can offer to companies as an agency. They all want, ultimately, more traffic and sales. New authors aren’t likely to have much of an audience they can tap in to, so they’re going to need help growing their brand and getting people to purchase their work. For this angle I would focus all of my content, ads and outreach on helping authors get their first 1,000 book sales. There’s already a book of the same name which was popular, giving further credit to this idea. If you can help someone get 1,000 sales then reviews and word of mouth should help take sales much further if the book is worth reading. I haven’t written about the subscription box business yet on Gaps – article coming soon – but it’s a huge industry. If you don’t know, there are thousands of companies who create physical “boxes of items” that they ship once a month. You usually only know the theme of the box, rather than what you’re actually going to receive. Mystery tackle, a box for fishing lovers. Just raised $1.3M. Mancrates, a box for men, has generated $21M in sales. Ipsy, who offer women a “glam bag” made $170M in 2016. I’ll write more about this in the future but, again, there are literally thousands of potential clients who have a great idea for a monthly box who need help getting the word out. 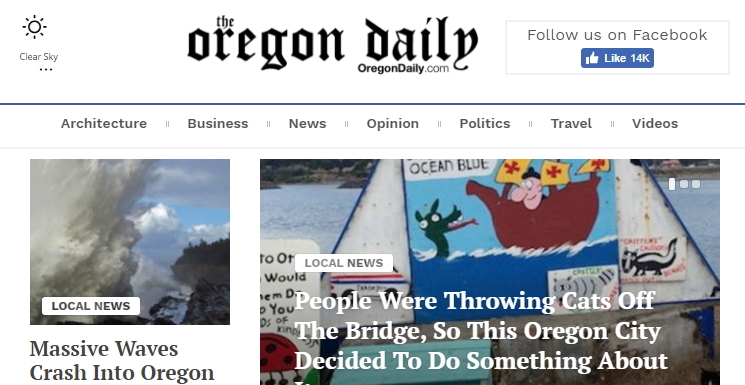 Fortunately, here’s one I have covered already on Gaps: Local news blogs. Since I wrote about them, more people are building them. I’ve received a few emails from people who have started these sites and are looking to promote them. Here’s one. There will be many more of these popping up even without me talking about them since it’s a great business opportunity. Of course, me just saying “here’s a niche to target” isn’t so easy when you don’t have a plan to follow, so let’s cover exactly that. Since I’m launching over an hour of free training today – and would love for you to watch it – there is nothing to opt-in for to get today’s strategy report. Instead, I’m going to lay it all out in the open. Notice I said a skill you want to learn. Not one you want to sell or teach. Selling and teaching come later when you truly enjoy immersing yourself in learning. I didn’t start learning SEO because I thought one day I could sell it or teach it to others. I started learning SEO in order to rank a website for DJ’s that I was building – creatively named MyDJSpace, hah – and figuring out all aspects of Google’s algorithm just became incredibly interesting to me. When the site started to rank on the first page for terms like ‘DJ forums’ and ‘DJ equipment’, I was totally hooked. I actually started caring more about learning SEO and doing it for more sites than I did about the DJ community. Even if you plan to outsource all of the work when you’re landing clients, you need to have a personal interest in the service you’re offering. It’s going to help a lot with step three. Pick one (yes, just one) particular aspect of marketing that you either currently enjoy the most or would like to learn the most about. You can of course change your mind later on, but if you don’t pick anything you’re not going to take action, so decide on something. This is the industry (like Automotive) or location (like Singapore) where your eventual clients are going to be operating. It’s important that you don’t just chase money when making this decision. Myself and Diggy picked Singapore to focus on because it’s one of our favourite places in the world and we’ve each been there about five times. It wasn’t too much of a push for Diggy to go and meet that client, even if it was an exception to the rule. We’re also very into cars, which is why we always mention the automotive industry in these examples. If you have no interest in cars or the car industry, then you’re going to hate working with car dealers and helping them generate more sales. Once you’re financially secure, there’s no amount of money that makes up for having to do work that you hate. Perhaps you’re interested in the start-up world and you love watching the journey of venture-backed companies trying to get their first 10,000 customers. It’s not a strange industry to pick. It’s exactly the type of industry to pick if that’s where your interests lie. 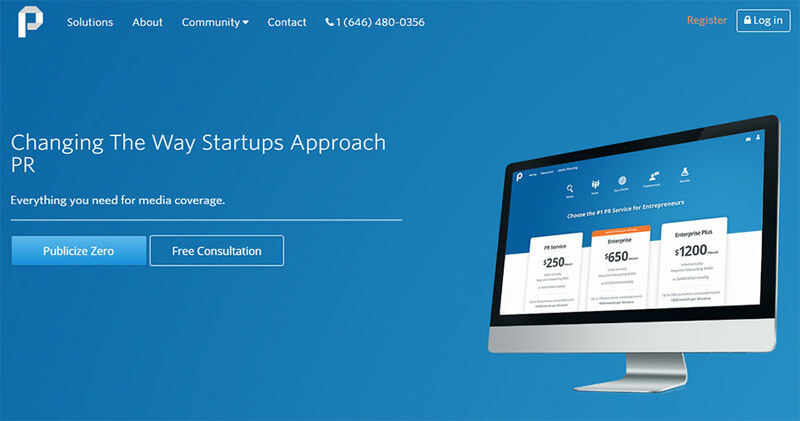 Publicize, mentioned above, made $100,000 in their first year doing marketing for startups with a small budget. They enjoy watching the journey of these new brands trying to make a dent in the world. While you may have multiple locations or industries you would love to serve, I again recommend that you just pick one. You can expand your offering later, but don’t spread yourself too thin when you’re just getting started. This is primarily why I told you to pick an aspect marketing you’re actually interested in. Your next task is to find every case study that has ever been created about that type of marketing. So if you’re interested in helping businesses with their content marketing strategy, you should literally fill up Evernote or Trello (or whatever you use to take notes) with case study after case study after case study of people using content marketing to grow businesses. I’m not joking or exaggerating here. I could name 50 successful marketing agencies focused on serving specific industries because I made it my mission to learn what they were doing so I could apply their models to my own business. If you want to make the type of money it will take to quit your day job, you need to put in the type of work that shows you want to quit your day job. If you’re just going to do a quick Google search, copy a few URL’s and call it a day, you’re underestimating what it takes to succeed online. Let’s say you have decided you want to run Facebook campaigns for those in the real estate niche. You need to follow the Facebook pages of big real estate brands and see what their audience are responding to. I subscribe to email lists in the real estate industry even though I don’t currently operate in that space. I want to know what people are teaching when it comes to marketing. Once in a while, if you’re getting insights from enough sources, you’ll get gems in your inbox like this one. 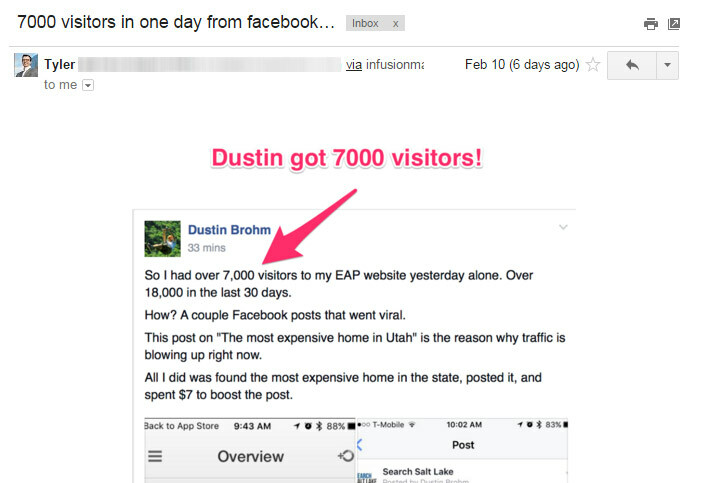 This realtor found that he sent more traffic to his website than ever before by running a Facebook ad about the “most expensive home in Utah”. You could now tell every other realtor on the planet, “Go and write a Facebook ad about the most expensive home in [your location] and boost it”. That’s the point of collecting case studies. You need a huge database of potential ways that you can help other businesses succeed by following the same strategies. This simple example, shared with the right person, could make you the best investment a real estate company has ever made. This is the step where you figure out what really works with the case studies you’ve found. Some you can test very quickly – like running a Facebook ad about the most expensive home in [city] – while others will take more patience, like how certain on-site changes can affect your rankings in Google. Just like collecting the various case studies, what you put into action here really depends on the type of skill you’re looking to get better at. I urge you again to forget about what you can sell or who to sell it to, but to focus on learning things for your own benefit. Which successful example of copywriting / email marketing / conversion optimisation have you found that inspire you to try something similar on your own website(s)? A few years back I was reading all over the SEO blogosphere that if you ask people around the world to click on your search results, Google notices the increased click-through rate (CTR) and rewards your website with higher rankings. I paid thousands of people to click on my search results from different countries and different browsers, all for different search terms and for different periods of time. Not one of the keywords I was paying people to click on and interact with resulted in higher rankings. Therefore, I’m not going to go and recommend that to any clients I have. 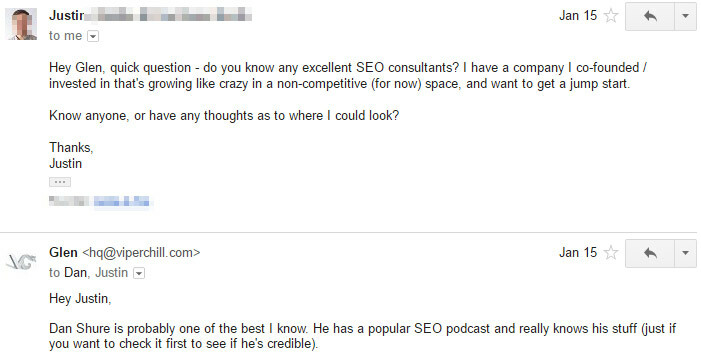 Just last week I started a new SEO experiment that a friend of mine swears by. He claims it was instrumental in selling his fairly new website for $7M. The thing is, it is so incredibly easy to game that I can’t even imagine Google would “fall for it”, but I’ve just spent $1,000 to see if it works anyway. Surprisingly, initial results are very positive. I’m not saying you have to spend thousands or even hundreds of dollars to see what works with a particular skillset, but you do need to know who is BS’ing for pageviews and which source you found really knows what they’re talking about. Remember: Even if you never land a client, you’re learning skills that you can always apply to your own websites at any point in time. ..is giving away everything you learn for free. Sounds a bit too simple, doesn’t it? But as someone who couldn’t be farther from the charismatic sales reps you can find on a TV show like Mad Men, it’s what has worked for me in getting constant requests to do SEO without ever having to pitch a single person. 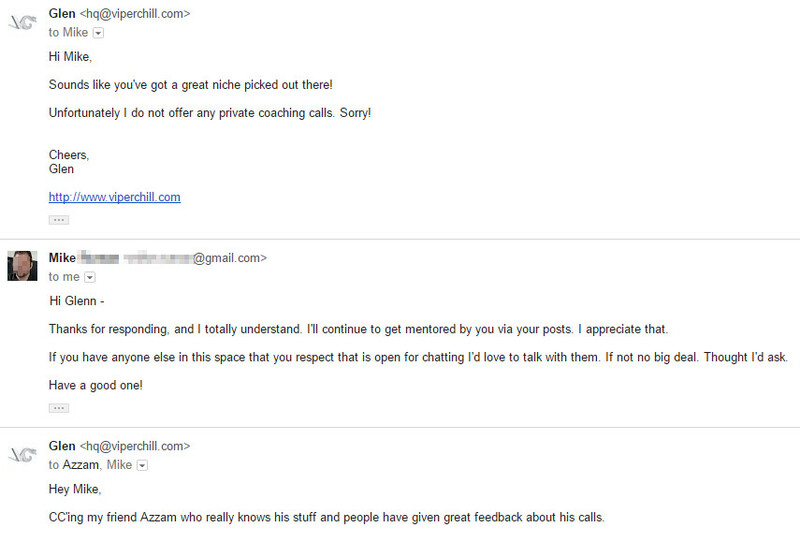 Just to be clear, I turn away every single client request I receive via ViperChill and have done for around three years. I already work with enough people, and on enough projects, that all of the work I could accept is far more than I could handle. I’ll sprinkle a few inbox screenshots like the one below in this step, but to clarify, I have around four people that I regularly send all of my enquiries to. These are people I trust and know do good work. There are two main parts to my “SEO empire“. The first part is about building brands and agencies that pull in clients. The second half is more about ranking websites in Google and renting them out. I’ll be revealing some of my rank and rent websites in next weeks update. When you brand your agency, I tend to think of names that are relevant to the service I offer or the industry I’m targeting. Note that when I say agency, I refer to your website or how people perceive you. I certainly don’t mean you need an office or dozens of staff or anything like that. But please, don’t think too much about it. After all, I’m the guy who named his first agency ‘ViperChill’. They’re all fairly simple and relevant to the industry they serve. Once you’ve decided on a name, you need to start being active where potential clients hang out. Do they take part in Facebook groups? Discuss their business on Quora? Have forums that they frequent? Wherever people hang out, that’s where you need to be. The next step is to find the specific problems that people are having to market their business and start writing or podcasting or videoing (you know what I mean) completely free solutions. Don’t try to offer any services upfront unless you’re familiar with selling and think you have value to offer. Instead, just aim to serve your industry. I get asked to do SEO for people a few times per week just because of my writing at ViperChill. Note that, again, I don’t accept any readers of my blog as clients. The reason I receive all of these requests is simply because I share almost everything I know about SEO for free. I enjoy writing about it. I enjoy learning about it. And I put in the work to market my writing. The end result is that I reach far more people than I could ever serve privately. It’s ironic that the more you give away the more you get back, but it applies to more areas of life than just marketing. Don’t think about how you can land your first 10 clients. Think about how you can help 10 businesses. The results will surprise you. What does a $500 webinar look like? Find out for free. 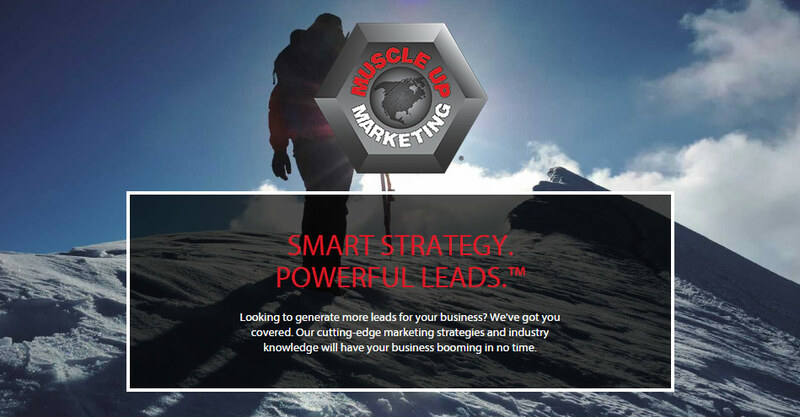 For the first time in four months I am opening the doors to my training program, Marketing Inc. This is the only thing I sell in the marketing space online and I am incredibly proud of it. It gets results. Unlike the majority of people in this space, I don’t come out with new products every few months and disappear. I’ve been working on Marketing Inc for four years now and it just gets so much better each year. If you have some interest in the business model, I go into a lot more detail in this one hour of free training over here. Just as a warning, I am taking the video down on Wednesday the 8th of February. No fake countdown timers. No “extended for 24 hours” emails. At 10AM EST on the 8th, the video will be gone. You can screenshot this as evidence if you like. I try to be 100% open about everything I do online, so I’ll say upfront there is exactly 59 minutes and 40 seconds of pure value, then around 15 minutes and 5 seconds of pitch. I can’t be more open than that. 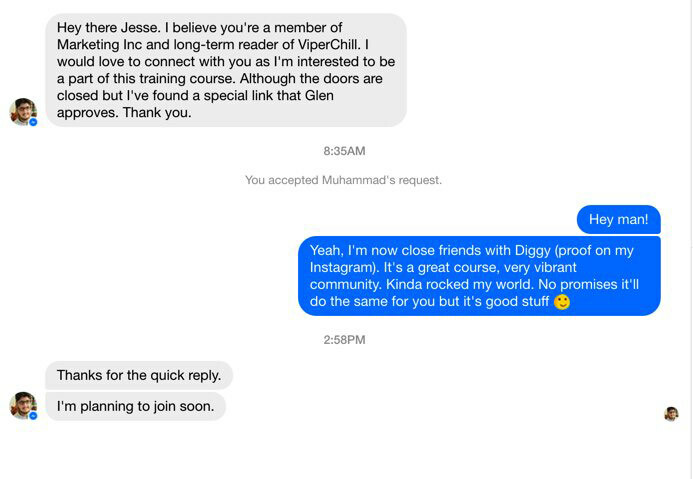 And just as a funny send off, last year when I shared Jesse’s success story (he landed the $5,000/m client within 24 hours), a few people reached out to him to ask him how he feels about the training. That’s what you get for putting your full name as your forum username, Jesse. With permission to share, he often replies like this. The video will only be online for seven days, so check it out. It includes a number of bonuses including student success stories and great industries to enter. If you have any questions about anything I’ve discussed today. Send me an email to hello@marketinginc.com. I will reply to every single one personally. P.S. Some exciting news. On the 21st of February (tentative but likely date) I’m going to be starting my first ever live case study where I build my own ‘gap in the market’ (a website) from scratch. I’ll be revealing the exact niche I enter, how I do market research and every step involved in building and promoting the site. Once it’s finished, I’ll be giving it away to a reader of Gaps, along with spending money to continue to grow it. If you don’t want to miss those updates, make sure you follow me on Twitter or Facebook, or via our newsletter.